Apparently a multi-port charger is something that Contractors were asking for, so Makita saw fit to make it a reality. 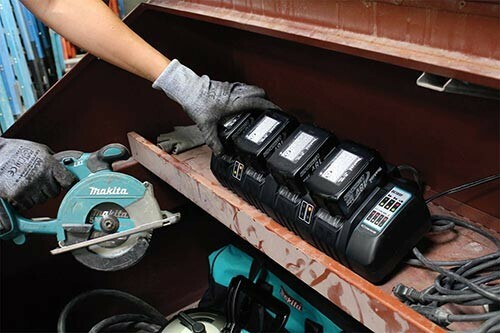 The new 4-port DC18SF features two controllers that use "Active 3 Controls" to communicate with Makita batteries to monitor current, voltage and temperature to maximize battery life and the charging process. Separate built-in indicator lights allow users to monitor the charging status of each battery. Now this is where things get confusing. Makita says that is takes 60 minutes to charge two LXT (3.0Ah) batteries and 120 minutes to charge four LXT batteries. So would it not be faster to just use two regular 30 minute Makita chargers? It would probably cost less too. Still, if you just want to throw 4 batteries on the charger at the end of the day and have them ready and waiting in the morning, this is the way to go.